After visiting the Barbican Centre, I was wandering around the lanes of 60s brutalist architecture and old Victorian terraces, trying to find a decent cafe. As with a lot of tourist attractions, nearby eateries tended to be aimed at either tourists or the business crowd. 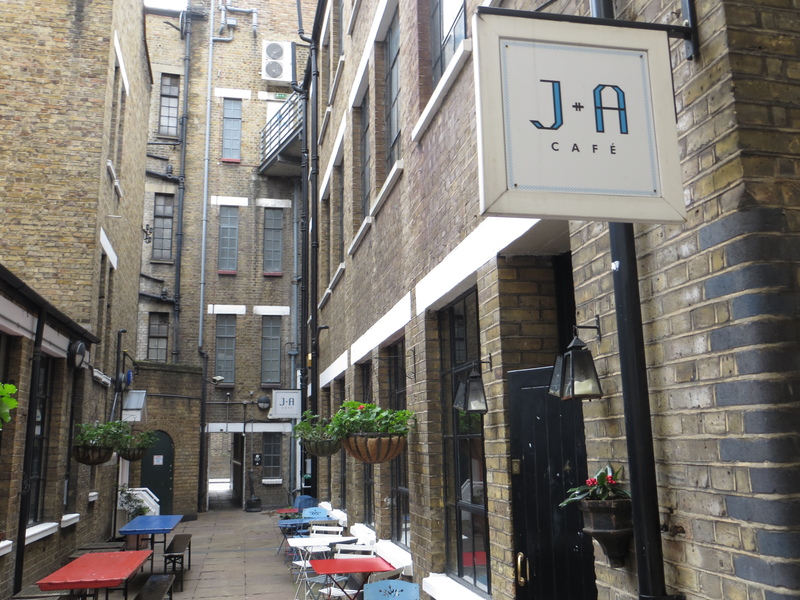 However, tucked away down a little alley off Clerkenwell Road was the wonderful J+A Cafe. With only a small sign out front to suggest there’s something through what looks like a doorway, I ventured in hoping for the best. On walking in my hopes were raised – it looked like my kind of place. However, when my cappuccino arrived those hopes dropped. Covered in chocolate and served in a rather large cup, I was expecting the worst. To my surprise, it was actually a very good cup of coffee. Tasting bitter, woody and not a little smoked, it was full flavour, if not a little over-milked. And I really could have done without the chocolate dusting. 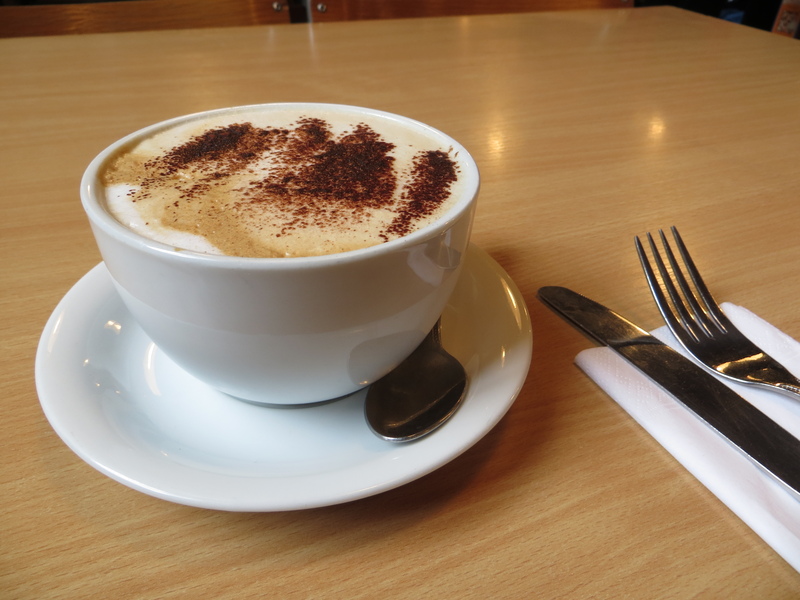 Still, the coffee from J. Atkinson & Co was top stuff and the added touch of a jug of milk already on the table was nice. 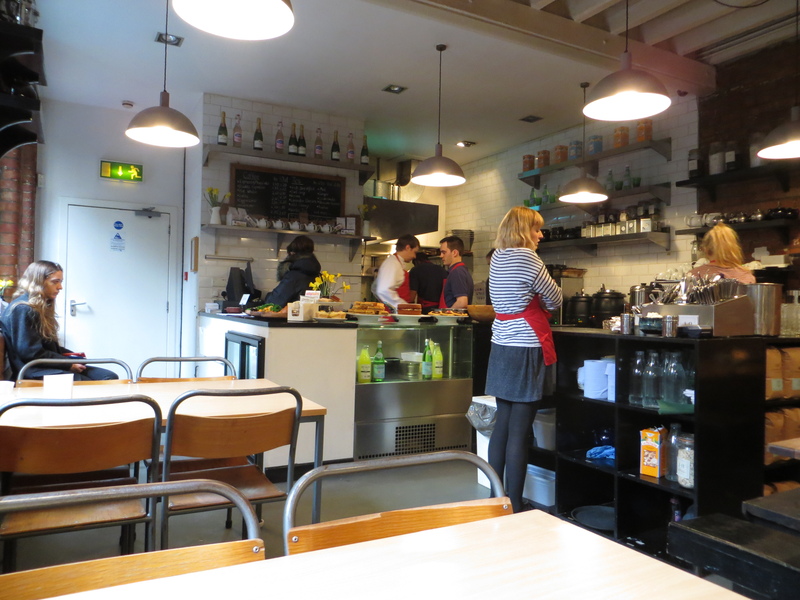 Lots of bare bricks, high ceilings and shared benches, gave this place a modern yet cosy feel. The music was interesting but not overwhelming and the open kitchen provide plenty of theatre. Tucked away on a little side street, this place would be a gem in the summer, with a few tables outside. The choice of some of the side tables left a lot to be desired. They were clearly going for shabby chic but ended up looking a bit 90s school canteen. Still, a place I’d happily wind away the hours. An excellent selection of cakes, starters and mains all with a home-cooked feel. I went for the daily special pie, which was minced beef, beans and smoked cheddar, which was truly excellent. 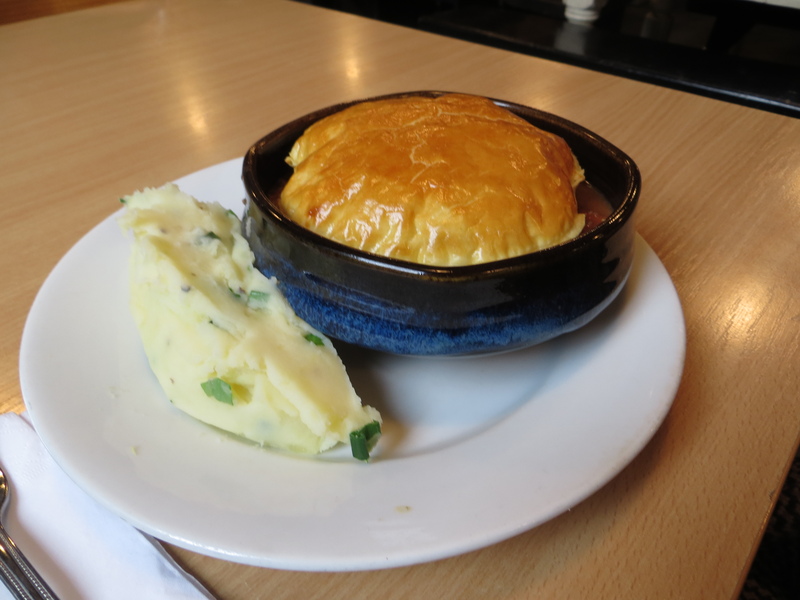 The cheddar was baked into the crust of the pie and the filling was rich, meaty and full of flavour. It came with a side of mash, which was peppered with spring onions. And at £10.50 it was, if not a bargain, a good deal. The other mains looked a lot more healthy with ingredients like quinoa, cous-cous and salmon popping up regularly. Great service from the numerous staff. Coffee arrived in minutes, plates were cleared without a word and the bill came quickly. Everyone was smiling and happy and keen to help. They had a nice exhibition of Instagram photos displayed throughout and across the alley they also had the J&A Bar, which wasn’t open when I went but looked fun. It is also available for private parties. A great find. If you’re visiting the Barbican I can thoroughly recommend this as a place to stop for lunch or a post-visit coffee. It manages that rare thing of having coffee and food that are both large in portions and high in quality.